A Federal High Court sitting in Lagos has restrained the Nigeria Police and the Department of State Services from arresting or harrassing the suspended Central Bank of Nigeria Governor, Mallam Sanusi Lamido Sanusi. The high court also ordered the release of Sanusi’s passport to him which was seized by DSS operatives immediately while also awarding the embattled CBN boss N50 million in exemplary damages. Mr. Sanusi’s passport was seized on February 20, as he arrived the Lagos international airport, a few hours after he was suspended as CBN Governor by President Goodluck Jonathan. 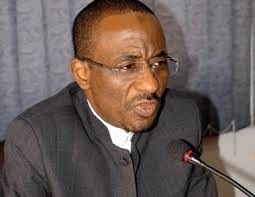 Sanusi was also briefly detained as well. fundamental rights as enshrined in the Nigerian constitution.